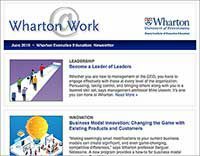 The Wharton Certificate of Professional Development (CPD) provides a focused approach to executive education that can demonstrate your professional value and help you address organizational change. 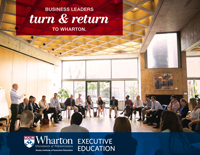 Hear from executives about why they chose the Wharton Certificate of Professional Development. I just finished my Certificate of Professional Development. I thought all of Wharton’s programs were done very well. I didn’t start with the intention of completing my certificate. I just kept finding courses that looked interesting, and I plan to continue to take classes. I find it is hard to stay focused while training in a work environment, whereas when you are in a classroom setting and surrounded by other committed people, it forces you to have the self-discipline to pay attention and you get more out of it. Another aspect I loved was every Wharton program I went to did not have a majority of people from financial services. I was exposed to leaders in manufacturing, retail, and different distribution channels, and many came from outside the United States. In my last program I had people from Africa, the Middle East, Europe, the United States, and South America — all within that classroom. So you got exposed to different industries and people from all around the world. I’m looking at advancing my career, and I thought what better university to invest my time in than the one that started the first business school? You learn from the best professors in the industry who are battle-tested, and you get amazing networking opportunities with peers from all over the world. Wharton gives you all the tools you need and the facilities are first class. Eric SabatoWestern Regional Sales Manager, Carber Holdings Inc.
Read more of Max’s story in Wharton@Work. Max BaumannCEO, Just Chill Inc.
Jacqueline MartinNational Sales Executive, MLS Group of Companies, Inc.
All three of the Wharton Executive Education courses I’ve taken on my path to earning my Certificate of Professional Development have proven helpful in my role as the family office manager for Mexico’s Batis family, started by Miguel Aleman Valdes, who was Mexico’s president from 1946 to 1952. I’m now serving the third generation of this entrepreneurial family, which has a rich heritage in building up Mexico’s tourism industry on the Pacific coast and more recently has invested in an airline and other entrepreneurial businesses to build up Mexico’s economy. In my role it’s a given that you have to be good at the financial and management side, but you get judged by the way you handle the personal side of the family business. Wharton has helped me enhance my communication and negotiation skills as well as my knowledge of investing and how to evaluate businesses. My career goal is to transform this family office into a proper enterprise institution that will serve as a legacy for future generations of the family. I hope to serve not only the third generation, who are now in their mid-40s, but also the fourth generation, who are not yet in their 20s. Lisa Larson, Associate Vice President, HDR Inc. 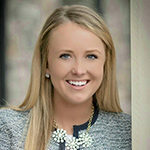 Contact Kelly Seybert, Associate Director, Client Relations, to schedule a personalized consultation.